BlackPeopleMeet.com is the largest online dating site for black and biracial daters of all backgrounds. BlackPeopleMeet.com a dating website geared toward black singles who are interested in meeting other black singles for dating, friendship, activity partners and long-distance pen pals was founded in 2002 and is the largest dating site of its kind in the United States and Canada. In one month, four percent of the total black population in the US will have visited the service. This site is for black men, black women and others who are interested in meeting someone special for friendship, a relationship or just to have fun. Having a large community of African American singles at your fingertips makes it easy and fun to connect with other singles in your area. Used by 1.4 million daters each month, the site’s search capabilities and free trial offer make it simple for singles to meet and date. The sign up process for Black People Meet is simple and extremely basic. It asks just a few questions, beginning with appearance. The survey asks questions one at a time regarding hair color, eye color, height and overall appearance. It also asks questions about your marital status and helps you indicate whether you have children. This part of the process also allows you to specify what you are using the website for so that potential matches can find you. 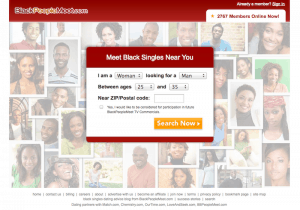 There is no matching system for Black People Meet, setting it apart from other dating sites. Members must find each other by searching and browsing profiles. You will be able to search based on age, location and appearance. Fortunately, you will be able to choose which types of members you want your profile to show up for. This way, you only get messages from people you want messages from. It is through your profile that other members will really get to know more about you to determine if you will be a good fit. Your profile is the first impression you send to each person who chooses to check you out, making it essential that you use it to show off your personality. This is the place you can talk about what you are looking for in a partner. You can also upload a couple of flattering pictures. Getting into contact with others begins with ‘flirting’ and for paid members this involves sending messages and chatting. You can also post audio and video messages to potential suitors. If you find yourself stuck on trying to decide what to send in a message to your potential date, each profile is equipped with a few questions to get you started on some topics of conversation. One of the best dating site!! !